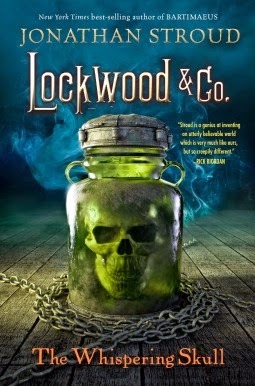 Presenting Lockwood & Co. #2 The Whispering Skull by Jonathan Stroud. As riveting as the first book, Stroud takes us headlong again into his alternative London with all of its creepy, ghostly splendor. The Whispering Skull provides another excellent addition to the paranormal genre and a great sequel to the Screaming Staircase. Lockwood, Lucy and George are again embroiled into another haunting business and this time the stakes are even higher than before. Stroud maintains the groundwork he established in the first book serving only to expand on each and every aspect of the story brilliantly. The mysterious, reckless and awfully calm Anthony Lockwood. The sensitive and smart Lucy Carlyle and the efficient researcher George Cubbins. The aforementioned skull plays quite the instigator in the events of the book as the trio race against time to solve the baffling mystery regarding a very dangerous and elusive boneglass mirror, their current problem. And as the protagonists open up more to one another and n Lucy's case experience a growth in power, we see and appreciate even more the bond they share between them. With a perfect sequel, Stroud has produced yet another master piece with the perfect spooky tone to set the mood. Sinister spooks of the otherworld and even more sinister human beings who seek profit in such ghostly source object dealings. Dark, ghostly and gory, sarcasm and humor and the spooky twists and turns enough to send chills down your spines. I said this with 'The Screaming Staircase' and i'll say it for 'The Whispering Skull', buy it, this is one ghostly sequel you must not miss. "A spooky sequel with the perfect mix of mystery and spine chilling ghostly adventure"
I quite like the sound of this, actually! At first it seemed a bit youngish for my taste, but an alternate (historical?) setting and ghosts... that's right up my alley. I'll add the first book on GR and try my best to read it soon.